WORK ON THE KRISHNARAJA SAGARA DAM, across the Cauvery River, which runs through Mysore and Madras. The great retaining wall has created a reservoir of 50 square miles, having a capacity of 44,000 million cubic feet. The water irrigates 130,000 acres of parched land and gives power for generating electricity for the cities of Mysore, Bangalore and other centres. IN few countries has the engineer been called upon to fight such stern battles against the forces of Nature as in India. Here he has built more than a score of mighty darns and barrages and dug many thousands of miles of canals in his efforts to combat famine, which has always been the great scourge of the land. India is indebted for her prosperity to-day more to the labour of civil engineers than she is to that of any other body of men. India, including the Native States, has an area of 1,809,000 square miles and a population of about 350,000,000. This vast territory is provided with a corps of engineers, subjugating and directing the resources of Nature for the benefit of this population, which numbers about a fifth of the human race. The canals and reservoirs which the engineers build obtain abundant harvests from a reluctant soil, and the railways transport the produce from the more highly favoured to the less productive districts. As these works have been put in hand, so has the scourge of famine been reduced. No country has suffered more from this dreaded evil than India. In the past, for season after season, large areas of the land have been suddenly smitten with famine because of the failure of the crops through the absence of rain. Famine in India has caused the death of millions of people. Scarcely a year formerly passed without a shortage of food over large tracts of territory through the failure of the crops. Millions of people were brought to the verge of starvation, and thousands of lives were lost from this cause alone. The Government of India has spent £111,570,000 on irrigation work, which has meant the reclaiming of 31,600,000 acres of waste and desert land. Including the irrigation schemes which have been carried out by the ruling Princes in the various Native States and by private enterprise, there are now some 65,000,000 acres of irrigated land in India. The money has been well and profitably spent, and has yielded a return on the capital invested of about 6½ per cent. This revenue is derived from water charges and from the sale or rent of the land. Sixty-five per cent of the population of this vast Empire is engaged in agriculture; suitable irrigation, therefore, is of vital import-ance. Unfortunately for the engineer, however, all kinds of irregular conditions exist. The chief of these is the extremely variable character of the rainfall. The average rainfall for the whole of India is 42 inches a year, but it varies considerably, being as low as 5 inches in some districts and over 400 inches in others. The rainfall is unevenly distributed, most of the rain falling during three or four months of the year at the time of the monsoons, but the amount of rain varies greatly from one year to another. The rainfall over a large area will often be only half, and sometimes less than a quarter, of the normal average. This is a serious matter, particularly to small farmers and to a population which makes a bare living. THE FLOOD WATERS, which greatly impeded work on the Mettur Dam, on the Cauvery River, in Madras, are now released through the sluices of this enormous structure. The effect of building the Mettur Dam has been to bring 1,000,000 acres under cultivation in the Cauvery delta and to protect the chief granaries of madras from drought and famine. There are vast areas in India in which, if reliance were placed on rainfall alone, the spectres of famine and drought would be ever present. Among them are the whole of the Punjab, the North-West Frontier Province, the United Provinces, Sind, a large portion of Bihar, most of Madras and Bornbay, and also certain of the Central Provinces. The irrigating engineer has to take the rainfall into account, but he has also to study the nature of the soil and the kind of crops it is proposed to grow. For instance. cotton ordinarily does not require any irrigation, and little even in years of drought. Barley needs irrigation only in a dry year. Wheat and the sugar cane require a good supply of water; and rice needs the largest supply of all. It is estirnated that one rnillion cubic feet of water are required to irrigate six or eight acres of ricefield, and a third of that quantity for wheat. Other crops cultivated in India are millet, jute, indigo and linseed. Some of these are spring crops, others are harvested in autumn; all require suitable soils and varying amounts of irrigation. In addition to the character of the soil and crops, the natural dispositions of the land determine what kind of irrigation must be adopted. There are three great systems in which the water is stored - in canals, in tanks and in wells. Of India’s 65 million acres of reclairned land, 29 million acres are irrigated by canals, 18 millions from wells, 10 millions from tanks, and 8 millions from other sources. Irrigating canals are not mere ditches, for some of the main channels are as wide and deep as the largest rivers in Great Britain. Two distinct types of canals are used, and they are known respectively as perennial canals and as inundation canals. Perennial canals draw their supplies from rivers at all seasons of the year; inundation canals take water only when the rivers are in flood. In a perennial canal a weir is almost always necessary, and its building often requires much engineering skill. In an inundation canal a weir is not required, and at the close of the flood season a waterway of this kind runs dry and remains dry until the next season’s rains. There are two other types of artificial waterways, the deltaic and the non-deltaic channels. Both types tap and distribute the water from rivers, but they differ in the distances over which they convey it and in the methods that they use. TWO DECKS, OR ROADWAYS, are built on the Lloyd Barrage, which crossed the River Indus, near Sukkur, in the province of Sind. The upper level contains the machinery for operating the sixty-six 50-tons gates, which are here seen in the course of erection. Each gate is 60 feet in width, and when the river is full has to withstand a pressure of about 300 tons. Two men can operate the mechanism which can raise one gate 32 feet in fifty minutes. The use of electric motors in an emergency ensures that all the gates can be fully raised in ninety minutes. The deltaic canals are used when the bed of the river which is tapped by them lies only slightly below the level of the surrounding country. No great length of canal is then required, because the water can be distributed by gravitation. Canals of the non-deltaic group tap the rivers high up in their courses, where the bed lies much below the surface, and they bring the water for considerable distances to distribute it by gravitation, or sometimes by a lift. An exceilent example of an irrigating canal is the Great Ganges Canal. With its distributing channels, this is 9,900 miles in length, and is responsible for the watering of 1,700,000 acres. The main canal is 200 feet in width and 10 feet in depth, and crosses four great torrents to serve a tract of country 360 miles from its head works. Two rivers, 200 and 300 feet wide respectively, are carriecl over the main canal in masonry aqueducts, and it crosses the Solani Valley by an aqueduct and embankments 2¾ miles in length. At this point 7,000 cubic feet, of water pass every second, and the gigantic artificial waterway is 12 feet deep anil has a breadth of 170 feet. The great Chenab Canal, in the Punjab, is fed by the waters of the Chenab River. The canal includes some 2,800 miles of channels, spreading over a tract of country nearly 4,650 square miles in extent. This area was all Crown waste land, virtually desert, before the canai was made. The laying out of this scheme was an extremely arduous task. The survey parties had to work across vast stretches of totally uninhabited country, where the only source of water might be brackish wells 100 feet deep, and where no supplies of any kind could be obtained. It was often necessary to remain in the field throughout the hot season, when the temperature rose to more than 110° Fahr. in the shade. In these circumstances good organization and much energy and determination were required from all concerned in the work. In the digging of these channels thousands of natives were employed. They greatly feared the man-eating tigers which prowled round the camps at night. Armed sentries were posted at every camp after dusk to drive these beasts away. As it was, the tigers succeeded in carrying off several workmen, and caused much panic among the men. On this reclaimed land there are now hundreds of thriving villages and a population of over a million. The Chenab River normally remains fairly full until the middle of October and suffices to irrigate the sowings of the winter crop. But later in the season the available discharge sometimes falls as low as 4,000 cubic feet a second, rising suddenly, when a freshet comes down, to 10,000 cubic feet. It has been found necessary to run canal telegraph lines in all directions to control the disiribution. This telegraph system is doubly useful when, after an unexpected fall of rain, there is a sudden reduction in the demand for water in the fields of this reclaimed area. It is easy to appreciate the anxiety of an engineer who learns that the canal is bringing down 300 tons of water a second, and that he must dispose of it. If there is no escape for the water, and the cultivators decline to run it on to their fields, he knows that the canal must eventually burst its banks. On most Indian canals there are facilities for letting off surplus water, but in the Chenab Canal the main courses are so far from the rivers that the provision of escapes back into rivers at the points where the water is needed is almost impossible. As an alternative, several depressions in the ground have been surrounded with earthen banks to form reservoirs, into which a portion of the discharge can be turned in an emergency. The water in them soon dries up and leaves them free for further use. They are planted with trees, and form little forests as well as escape reservoirs. THE LLOYD BARRAGE has an overall length of 4,726 feet. Large cofferdams of interlocking steel piles were built to enable the foundations to be laid. One of the cofferdams, which enclosed an area of 46 acres, is believed to be the largest ever built. As the silt of the bed of the Indus was so deep it was impossible to reach a solid foundation. 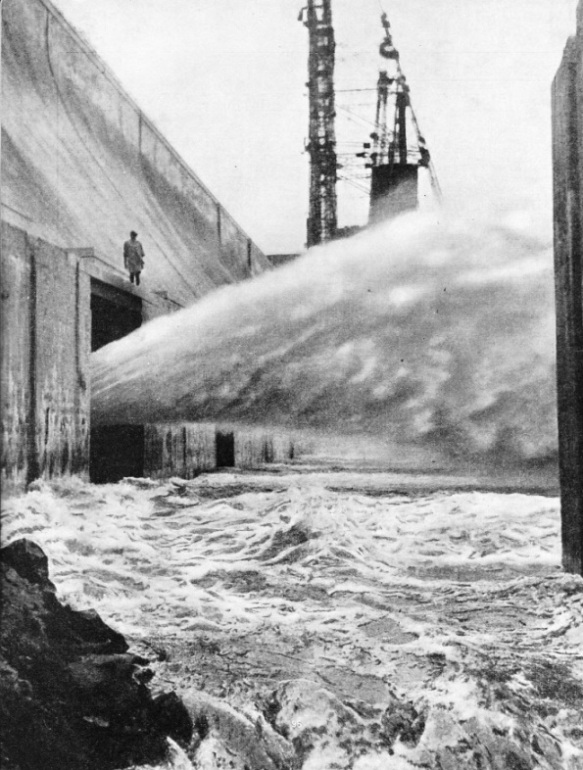 The great barrage stands on what is virtually a raft, 190 feet wide, composed of huge concrete blocks. To prevent water fro working under the foundation, the river bed on either side is lined with heavy stones. At the head-works of the Chenab Canal the river is about 3½ miles broad - broader than is necessary for the discharge of the floods. A weir to hold up the water as much as 12 feet above low-water level has been built in the bed of the river. The weir itself is only 4,000 feet long, but, over it the whole discharge is compelled to pass by a system of walls. Measured in the direction of the stream the weir is 250 feet wide. The crest is of masonry, 8 feet high and broad, with its base generally about 4 feet below the original summer level of the river; 40 feet upstream from this wall a masonry curtain wall has been sunk 20 feet into the bed, to prevent undermining. The weir is divided by masonry piers into eight bays, each 500 feet wide. Between the piers, on the crest of the wall, are rows of vertical iron shutters, the construction and action of which may be taken as typical of all those now generally used on Indian weirs. The shutters, 6 feet high, 3 feet broad, and made of 3/16-in steel plating, stiffened with angle iron, stand side by side in a continuous row between the piers. These shutters, operated by a crane, control the flow. More than 10,000,000 acres of waste and desert land have been reclaimed in the Punjab. Irrigation has changed this great Indian province from one of the poorest into one of the most prosperous. One of the most spectacular irrigation feats carried out in the Punjab was the reclaiming of the Desert of Montgomery, lying some fifty miles to the south-west of Lahore. The only river from which water could be obtained for irrigating this great tract was the Ravi, but this had already been tapped. Two hundred miles farther north, however, there was still plenty of water in the Jhelum. The question which the engineer had to solve was whether water could be brought to Montgomery from the Jhelum with the Chenab and the Ravi Rivers in between. He decided that this was possible. Three canals were built. The first, known as the Upper Jhelum Canal, took the spare water of the Jhelum and poured it into the Chenab, irrigating 350,000 acres on its way. The Chenab and Ravi Rivers were then united by a second canal, the Upper Chenab Canal, which irrigated another 650,000 acres in Gujranrvala and Sheikapura. 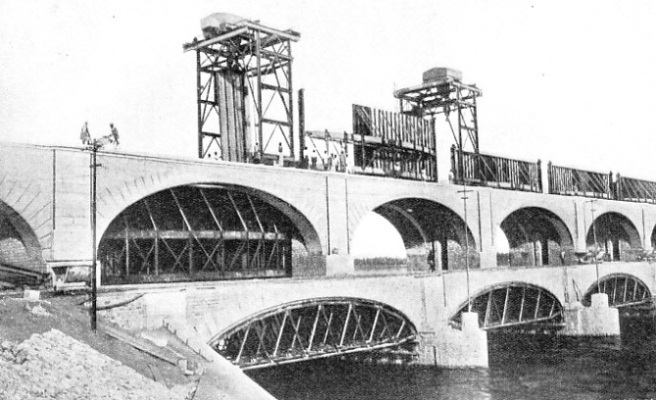 Finally, the water that remained was carried across the Ravi by a level-crossing - a barrage 1,650 feet long was carried across the river - and a third canal, the Lower Bari Doab Canal, took water another 134 miles to Montgomery. The Lower Bari Doab Canal is 200 feet wide and carries a volume ol water ten times as great as that of the Thames at Windsor. The canal irrigates some two million acres of barren and desert country and provided homes for thousands of settlers. The work occupied some time and was carried out by some 8,000 natives of mixed nationalities, superintended by only four Europeans. Some ten million acres are irrigated from tanks. These are not tanks in the sense normally attached to the term, but are lakes or reservoirs of vast extent. There is a dam in Mysore 142 feet in height, built across a valley near Marakanave, holding up water from a catchment area of 2,075 square miles. When the reservoir behind the dam is filled, it contains 30,000,000 cubic feet of water, and yet in Indian reckoning it is only a “tank”. The length of the great barrier is 1,350 feet and the depth of water near the dam 130 feet. The lake it creates covers an area of thirty-four square miles. There are more than 30,000 of these tanks in the Madras Presidency alone, and in Mysore there are three or four to the square mile, the total being 40,000. They are a source of anxiety, because if a flood should burst one tank others in the vicinity would almost certainly be swept away. Many of the tanks found in India are of great antiquity. For instance, those of Chingleput, in Madras, are said to be 1,100 years old, and they still irrigate areas of some 2,000 acres. Another famous tank, known as the Giant’s Tank, was built in the fifth century, and the old embankments can be traced for fifteen miles in the jungle. There are records of a large tank having been built in Ceylon 2,400 years ago. METTUR DAM, on the Cauvery River, is one of the largest dams in the world. The retaining wall is 5,300 feet long and 180 feet high, and impounds some 90,000 million cubic feet of water in a reservoir 40 miles long and 100 miles in circumference. 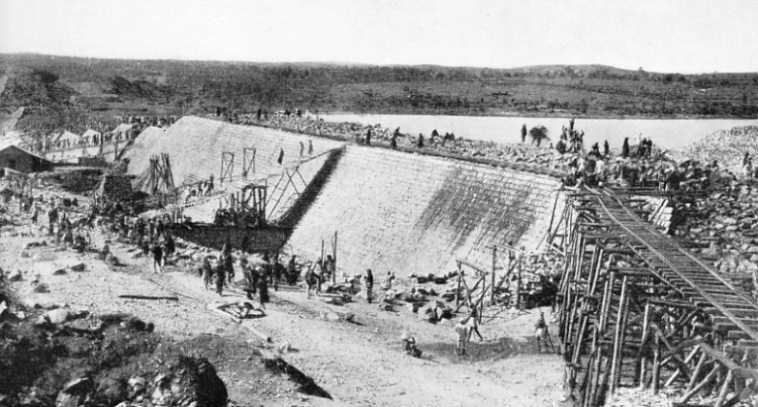 The dams built by the modern engineer to form some of India’s irrigation tanks are wonderful structures, surpassing in extent, and in the difficulty encountered in their building, the great barrages of the Nile. There is the Tansa Dam, in Mysore, 1½- miles long, impounding 300,000,000 gallons of water, and forming a lake 20 miles in length. Other wonderful structures are the Nira Dam 3,000 feet long, and the Khadakvasia Dam at Poona, one mile long. 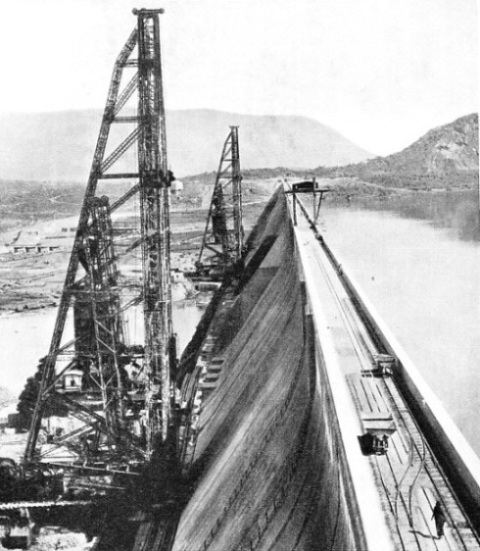 There are several dams 200 to 300 feet high, and one now contemplated, the Bhakra Dam, to be erected in the Punjab, will have a height of 500 feet, making it the highest yet built. Another fine structure is the recently completed Mettur Dam, a great masonry work. It was finished just in time to save the crops of 1934 frorn failure because of lack of rains. The Mettur Dam, on the Cauvery River, 180 miles south-west of Madras and 100 miles north-west of Trichinopoly, is particularly arnbitious. Not only is it one of the largest dams in the world, but it is also to forrn part of a large hydro-electric plant to supply Southern Madras with cheap power. The building of the great retaining wall was no light task. The Cauvery is a refractory stream and is subject to sudden and violent floods. Securing the foundations in midstream gave the engineers many anxious moments. On several occasions work had to be abandoned for days at a time because the works were swarnped by flood waters. Once the wall rose above flood level progress was more rapid. Because of the vast quantity of water it was desired to hold up, the great retaining wall had to be of a massive character. It is 5,300 feet in total length, towering 180 feet above the bed of the stream. At the foundations it has a width of 171 feet, tapering to 20 feet at the crest. The great structure contains 1,852,000 cubic yards of rnasonry, representing a weight of 3,200,000 tons. It has created a huge reservoir which extends 40 rniles up the river, has a circumference of about 100 rniles, and holds up some 90,000 million cubic feet of water. Not only has the dam brought a rnillion acres under cultivation in the Cauvery Delta, but, also through 70 miles of rnain canals and 600 rniles of distributing channels it has added another 300,000 acres of irrigated land to India’s artificially watered area lying a hundred miles distant. As an effect of this vast project, which has demanded an expenditure of £5,500,000, the chief granaries of Madras are now assured against drought and famine. water to the thirsty land, and the hydro-electric power plant. The dam is a masonry structure 130 feet high and 1¾ miles in length. It contains 30 million cubic feet of rnasonry and over 8 million cubic feet of earthwork. It impounds some 44,000 million cubic feet of water, creating an irnnrense lake 50 square miles in extent. The dam is pierced by more than 160 sluice gates. The larger gates are of cast iron and weigh about 3½ tons each. The dam is finished with ornamental parapets at the top, and is electrically lighted. There is a motor road across the crest of the dam. NIZAMSAGAR DAM, built over the River Manjra, is part of a huge irrigation scheme carried out by the Government of Hyderabad. More than 20,000,000 cubic feet of earth and stone were excavated for the foundations of the dam. The enormous flood gates, which weigh 17½ tons, are 40 feet high and are 15 ft 6 in wide. At the rear of the structure are terraced gardens, with fountains and cascades. There is an image of the Cauvery river god at the head of the gardens. In the creation of the lake, over a score of villages were submerged, including some Indian temples. These temples were rebuilt near the site of the dam and the temples and gardens are visited by rnany people annually. The object of the dam is twofold - to supply water for irrigating 130,000 acres of land round about Mandya, Maddur and Malavalli, which were subject to periodic droughts, and to generate electricity for lighting the cities of Mysore, Bangalore and other centres. rice and the remainder to miscelleanous crops. The building of these dams in wild country, far from the centres of civilization, is no easy task. That across the bed of the Periyar River, in Travancore, may be cited as an example of the fight which the engineer is waging against the forces of Nature when he sets out to tame India’s refractory streams. The site of the dam is in hilly country, an uninhabited region, covered with dense jungle and infested with eicphants, tigers and buffaloes. For six months of the year the Periyar River is in flood. In these conditions work upon the dam’s foundation was impossible; then malaria stopped work for another three months, leaving only three rnonths’ labour out of the twelve. The darn, which rises above the bed of the stream to a height of 178 feet, is 139 feet wide at the bottom and tapers to 12 feet at the top. It absorbed five million cubic feet of concrete, composed of 100 parts of broken stone, 30 parts of sand and 25 parts of hydraulic cement, as well as stone for facings. The transport of the materials alone was no light feat, for the nearest railway was eighty miies distant. At the site a ropeway was erected by which the concrete and heavy stones were lowered to the workers on the great retaining wall. On one occasion an infuriated bull elephant dashed into a camp where 280 natives had retired for the night. He trampled down the tents and scattered the workmen far ancl wide. Before the elephant could be brought to bay and shot he had killed two men. That night search parties had to be sent out to bring in the scared natives, and it took all the persuasion of the engineers to induce the men to stick to their job and not to return horne. level, the escape level giving passage to surplus water during heavy floods. One level is 31 feet above the other. 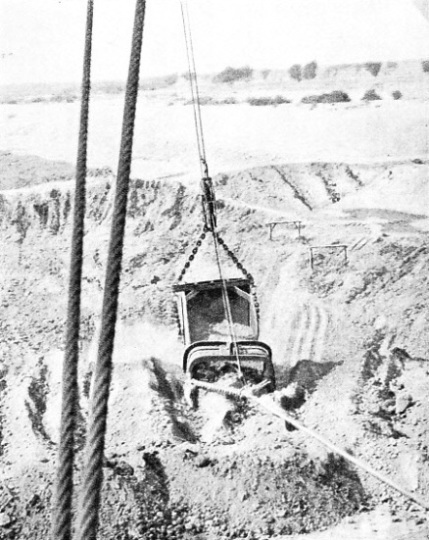 THE BUCKET OF A DRAGLINE, such as those used in the excavating of canals forming part of the Lloyd Barrage scheme, has a capacity of 8 cubic yards. At one bite, the bucket excavates sufficient material to fill an 8-tons wagon. Draglines are steam navvies with huge buckets which are dragged towards the machine by strong flexible cables. At the flood level the lake has an area of 7,454 acres, its greatest depth being 162 feet. At the normal level it has an area of 3,765 acres, and is 131 feet deep. At escape level the cubical contents are 13,299 million cubic feet and the volume of water available for irrigation is 6,815 million cubic feet. This is sufficient for more than six weeks’ supply. The water thus stored is carried from this great reservoir through canals for a distance of 86 miles to the Madura district, where 250,000 acres of waste and desert land have been reclaimed. been collected beforehand, by emissaries of the Government or by the irrigation engineers. On one occasion there was a scare of this kind in Dinapore, near Patna, in Bihar, at the inception of a new scheme. The natives gravely asserted that an order had gone forth for human heads, and that the soldiers of the neighbouring garrison were killing men to obtain the necessary material. They were so convinced of the truth of the story that they would not stir out at night unless two or three went together. virtually rainless and the Indus is its only river. decision to harness its flow and, more important still, to bring under perennial irrigation a large area of Sind. 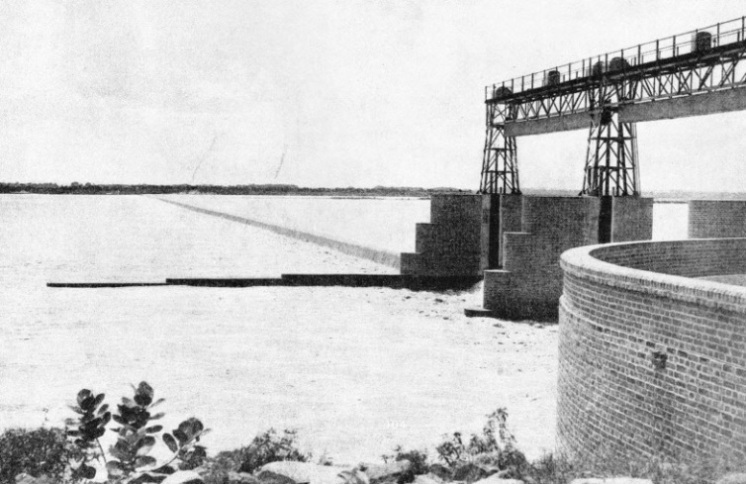 Eventually a great retaining wall, known as the Lloyd Barrage, was thrown across the stream at Sukkur, a point some 400 miles from the river’s mouth. More than 6,000 miles of canals were dug. Some 7,000,000 acres of parched and waste land are being brought under cultivation. 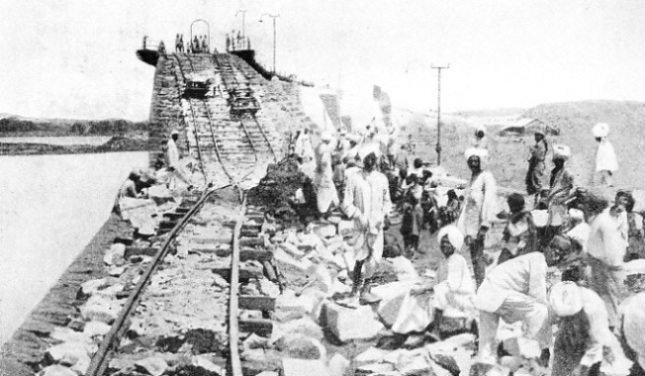 The scheme, perhaps the most spectacular feat which the engineer has carried out in India, demanded nine years of patient toil in a hot and arid land, and cost £15,000,000. Harnessing the Indus was no light task. For eight months of the year the stream is comparatively placid, but during the remaining four it is in flood. When in full flood the flow is extremely rapid. The scour or erosion is tremendous and is erratic in its action and direction. 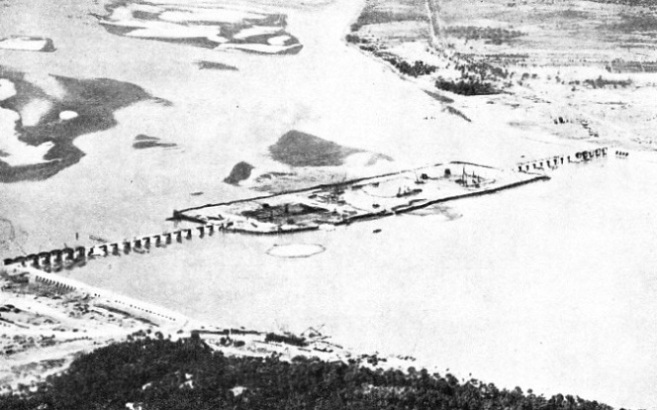 Thus the barrage had to be built in sections by means of cofferdams of immense size. One of them enclosed an area of 46 acres, and is believed to have been the largest ever built. The dams had to be sunk in the dry season, and their building often called for feverish work before the river rose again. A miscalculation or an unexpected flood would have meant the ruin of the whole season’s labour. The work was carried on without cessation, day and night, with the aid of powerful arc lights. reality a raft, 190 feet wide, fashioned of huge concrete blocks. MASONS FASHIONING STONES for the parapet of the Krishnaraja Sagara Dam, near Mysore. This dam has a height of 130 feet above the bed of the River Cauvery and has a total length of 1¾ miles. Some Indian temples were submerged in the reservoir and were rebuilt near their original site. To prevent water from working under the foundation, the river bed on either side of the concrete base, for a distance of 120 feet, is lined with heavy stones laid close together. As a further precaution against the possibility of damage by seepage, the edges of these stones, on the upstream and downstream sides, are further protected by sheet piling. and fifty-four of thern are 18 ft 6-in in depth, the remaining twelve, which occupy positions near the banks, being 22 ft 6-in in depth. The great barrage is in reality a kind of double-decked bridge. The lower deck is the road bridge designed for the use of ordinary traffic. On the higher deck, known as the gate bridge, is the mechanisrn for lifting and lowering the gates, an operation which can be carried out by two rnen, the time required to raise one of the gates through 32 feet being fifty rninutes. To deal with sudden floods or other etnerrgencies it rnay become necessary to raise the gates more quickly. Six travelling trolleys equipped with electric motors have been provided for this purpose, and their use enables all sixty-six gates to be raised to their greatest heights in about an hour and a half. miles, spreading out over the country from either bank of the river. Including the final distributing ditches, the total length of canals and irrigating ditches will exceed 50,000 miles. Yards, sufficient to fill an 8-tons wagon with a single bite. Furthermore, the bucket could be lowered, the cut made, and the excavated material raised and dumped into a waiting wagon or on to an embankment in forty-five seconds. excavating the main canals, of which there are seven. Digging these canals in the desert was a difficult ancl monotonous task. Sind is subject to strong winds and frequent sandstorms. The heat was trying, the thermometer registering from 115 to 120° Fahr. in the shade during the summer months. The draglines were operated on a three-shift basis, night and day, summer and winter. So well organized was the whole undertaking that the barrage was officially opened nearly a year before the scheduled time. Thus did the engineer conquer the great Sind desert and win another victory in lndia in his efforts to combat the famine scourge. AN IRRIGATION WEIR on the Damodar River in Bengal. 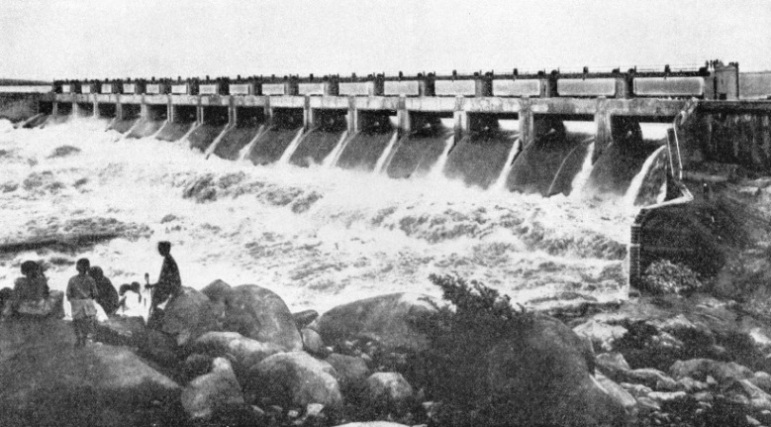 The weir, which is 400 feet long, was opened in September 1933, and helps to irrigate some 200,000 acres of land. In 1932 a section of the scheme was put in operation and saved the harvest over an area of 25,500 acres which was threatened by drought. The Government of India has spent millions of pounds in combating the scourge of famine. You can read more on “Conquest of the Desert”, “Fighting the Drought Menace” and “The Nile Under Control” on this website.